Permanent & Painfree Hair removal on all body of skin type I-VI. -- lip hair removal, beard hair removal, chest hair removal, armpit hair removal, back hair removal, & hair removal on outside bikini line, etc. The 808 (810nm) near infrared laser of hair removal system is best of absorbing melanin so that can effect in different parts and hair follicle and reach to removing any hair effectively. 1. Micro-channel technology –Micro cooling system makes diode module working much safer. 2. High quality spare parts --all the core components are imported . Swizerland imported micro-channel laser bars. Germany imported semiconductor cooling system, insures the machine continuously working 24 hours without any stop. USA CPC water connector & Germany Harting electronic connector. Italy water pump, no noise and larger water flow for better cooling, prolong laser life. 3. 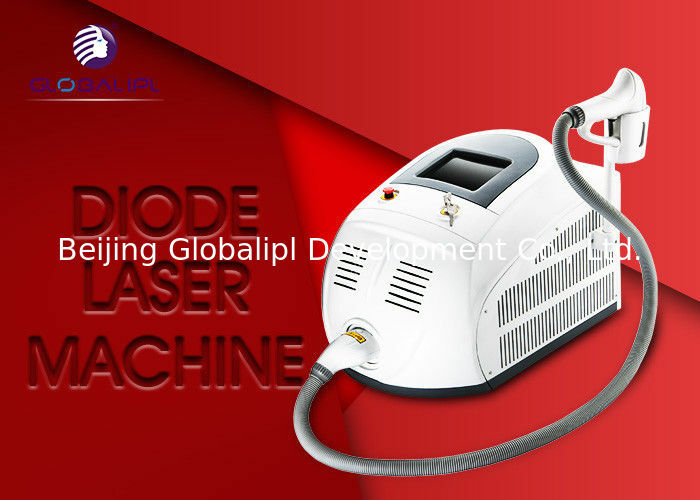 Newly designed diode laser handle, more stable and convenient to use. 4. High quality water filter and testmeter, insures the high purity for the water, prolong the lifetime of laser bar. 7.Automatical alarm system: once any problems happens, machine will stop working immediately. Protect the patient and machine firstly. 8. Medical CE approval high quality promised. Diode laser hair removal technology is based on the selective dynamics of light and heat. The laser goes through the skin surface to reach the root of hair follicles, light can be absorbed and converted into heat damaged hair follicle tissue, so that the hair papilla is damaged without injury surrounding tissue. No pain, easy operation, the most safe, technology for permanent hair removal now. How many treatments for 1 session? Hair life circle is divided into 3 phases, Anagen,Catagen and Telogen. Anagen is the best time for destroying root of hair. Hair in Catagen and Telogen phases can't be completely destroyed because laser can't act on their root effectively. So to remove hair completely, 1 session needs 3-5 times treatments. Beijing Globalipl Development Co.,Ltd is a high-tech company engaged in developing, research, production, sale and after-sale.With the customer-orientated business philosophy and the purpose of science and technology first, ensure high quality and cost-effective products for customers; which makes us gains lots of customers all over the world. Globalipl company works hard at all times, is to became a famous international OEM/ODM manufacturer of all aesthetic & medical equipments in the world. Shipment: We can offer the door to door service by air or by sea, just depend on your actual request. Such as DHL, UPS, TNT, FEDEX… by air; and the sea transportations. 3. Delivery Date: 3-7 Days.